In contrast to views from the still-to-be-established US-ministry for alternative truth earth is not flat. It is not a perfect sphere either, but rather something like a flattened ball. Here I will not detail recent satellite measurements, but rather go back in time to a man, who calculated the earth’s radius with astonishing precision: Eratosthenes. 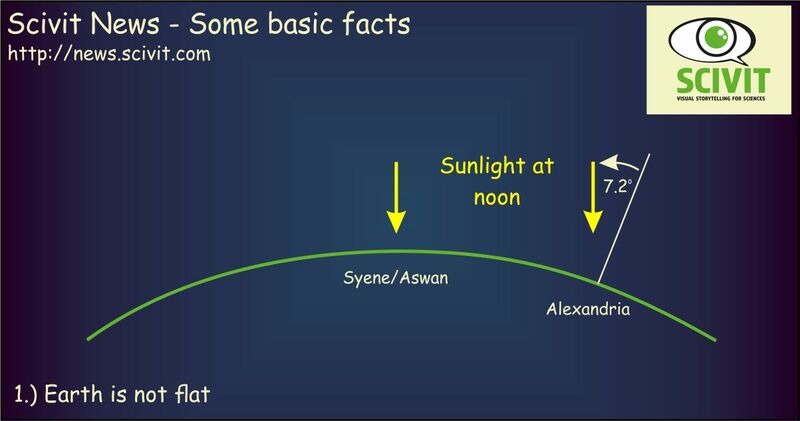 He noted that concomitant observations from two different egyptian towns (Alexandria and Syene/Aswan) give different positions of the sun in the sky. He concluded that this difference was due to a curvature of the earth’s surface and calculated the earth’s radius to be 6645 km. This is only 4.2 % more that the value determined with modern equipment.